2855 North Druid Hills Rd. Frugal Kitchens offers options to help your kitchen become your best loved room in the house. Frugal Kitchens helps you to create a beautiful and stunning room that will make you want to spend more time in it. Frugal Kitchens offer many types of kitchen remodels depending on your taste and budget. They utilize your existing kitchen layout and appliances to help keep your kitchen within your budget. With their easy to use programs you can choose the type of upgrades you want and stay within a budget you can afford. Frugal kitchens also offers granite and custom cabinets to further elevate the elegance of your kitchen. Go to any big box store and you'll find the same process: Choose your cabinets: $$$. Choose your counters - extra $$$. Choose your sink - extra $$$. Ask the big box to tear out your old kitchen and install your new kitchen... much EXTRA $$$, plus they'll send "sub-contractors" that may or may not get it right. My investigation has found Frugal Kitchens and Cabinets delivers a much less expensive, all-inclusive price that includes taking out the old kitchen, using a licensed plumber and electrician to install your dream kitchen, all within 5 to 7 days! Frugal Kitchens & Cabinets has beaten the big box discounters at their own game, and saves you thousands of dollars in the process! How do they do it? My investigation finds Frugal Kitchens & Cabinets delivers great prices and quality by mass-producing their cabinets for color and sizes. Cabinets are all wood with solid wood fronts; dovetail drawers and soft closed runners. There is no particleboard in any of their cabinets. Plus, your package includes real granite counter tops and a double bowled under-mount stainless steel sink. Frugal Kitchens hires the best installers. Most discount companies hire discount employees to keep their profits up. Frugal Kitchens hires real craftsmen, who could hand build your cabinets if needed. They then take delivery on those cabinets and give your kitchen a custom style look without a custom style price. Your experience begins with a low-pressure sales presentation that allows you to take your time. Two convenient showrooms, (Roswell and Fayetteville) plus a great informative website allows Frugal Kitchens & Cabinets to fine tune your kitchen to perfectly fit your taste. Once you've made your decision, their team of experienced professionals makes the difference in how your cabinets and countertops look; giving them a custom appearance without a custom style price. Customer Service from the Designer to the Installers, all committed to doing what they say they will do! 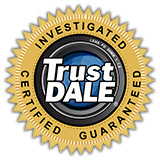 Plus, you're double protected, by Frugal Kitchens & Cabinets, and the TrustDale Make It Right Guarantee!